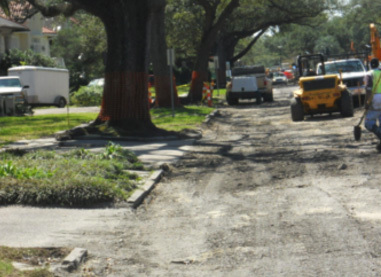 Design Engineering, Inc. is responsible for providing all services required for preparation of preliminary design plans, final plans, specifications, and bid documents for the reconstruction of Audubon Boulevard (Willow Street – South Claiborne Avenue). 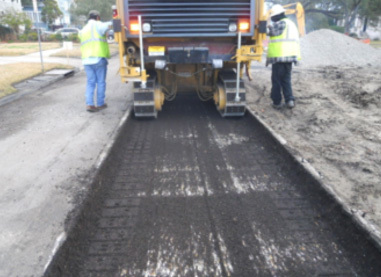 DEI is also responsible for the following design features: roadway pavement complete with curbs; a base for the roadway pavement; subsurface drainage; water, and sanitary sewer installation, modifications, adjustments and repair as required; adjustments as required at driveways, at intersecting streets, and at project termini. Final grades must be compatible with adjacent properties and insure a positive flow of water towards catch basins. Installation of ramps for the handicapped at intersections (including medians) shall be included. Specifically, this project includes the design, construction administration and resident inspection for a 2,900 LF of new roadway. 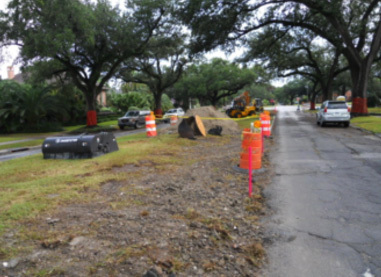 Included in the project for Audubon Boulevard, a divided roadway with raised median is a new concrete roadway with concrete, or granite curb and gutter, 2,900 LF of subsurface drainage varying in size from 12” ø to 60” ø RCPA equivalent, 2900 LF of 8” water main and 3000 LF of 8” sewer line, gas line and electric line relocation, new water meter and new sewer and water house connections.